TAGWARE For All Your Tech News. For those that like to view the solution. Here is the video link explaining. For the rest of us keep reading! RED has now established a Production product (GEN3) that they have been able to convince the Jabil manufacture to produce them in 70 places over most parts of the world. Thus sidestepping the costs of manufacturing and stock that have to normally financed by the company. They also now have sufficient size deals over the 100+ million mark. To allow institutional investors to look and actually put together finance packages. There is already strong interested in backing both Wind and PV farms as they are in the 20-25 year term investment. These achieve a 6-8% return. When you add the RED energy engine which allows for extended power for over 4+ hrs periods. Which both National Grid and large corp users are realising can drastically cut the electricity bill and provide Grid Balancing services to the National Grid providing the JAM to the deal. This then increases the return to 10%+ over a 25-year time span. Something that an institutional investor would think a reasonable investment. RED has been able to obtain and 1,600 units commitment from a Germany order. As they are further forward in renewable markets. This along with the orders from the Monash University in Melbourne, Australia place them for even more growth through word of mouth. With the October 2018 event to still arrive in Australia for more spreading of the word. In August they announced a UK order from Anglian Water again a small step for this group. However, a significant one. As this is a large well know UK company which has a large energy bill of £77 million that can see significant savings to place their toe into this new market. The potential of this client with its 1200 water treatment and water recycling centres would keep RED busy. However, this is one of the 10 companies that have the same problem. They can now deploy local PV on-site and the RED storage systems and greatly reduce their overall electricity bill. I believe that this firm has turned the corner, all be it slightly later than most of the investors had wished. For those that have been looking. I would suggest this is the time before the blue touch paper runs out on the share price. When large investment houses start to understand the real opportunity. We have had this system for a couple of years now without issue and decided to spread the word in the UK. As some of our readers are slow in changing their energy provider. :o( Tut Tut. The system comes in two parts. One for the electricity install and a second for the Gas meter. The idea is to set up the electricity one first which is the Orange coloured box and then the blue one after which is the Gas supply. They provide a couple of YouTube video’s that guide you through the process. It sounds scarier than it really is honest. The Gas after you’ve installed the Electricity! You’ll be pleased to hear that the 2.4 or 5Ghz Wifi will not be used. It uses a 433Mhz band that should allow it to reach most places from the router. You plug the base unit into the Broadband Router. Thoughtfully they have allowed this to be a pass-through type. So, if you are short on the number of connections on the router. This allows the device that was plugged into port to be so after. This is powered via a USB which most routers now have. Once this is done the base unit talks back to the internet server. You need to take a note of the Id on the base unit before you do this though! The process then after connecting the clamp on the electricity supply is reasonably painless. You go through a sign-up process on the website. Which, will ask for that ID number that you should have taken note of! One should note. That the clamp goes around the wire and doesn’t have any physical connection to the supply. Hence you don’t need an electrician. The same applies to the Gas meter. Which, once you have completed the Sign-up and got the electricity supply part working. Gas monitoring is achieved by following a setup procedure via the website. You have to know the type of Gas Meter and its Metric or imperial. But, these are quite easy to distinguish. As they supply the details along the way during the setup. Then, they just need to know the MAC address which is printed on the side of the Gas monitor. The setup routine does ask for this before they ask you to connect the monitor to the Gas meter. Once you have connected the monitor to the Gas meter. All that is needed is to push the button on the device itself. Which, kicks off the setup routine. You need to turn up the Thermostate to make the boiler kick into life. Then, the system checks that it can establish that the dial that spins on the Gas meter is picked up. After a cup of tea (15 mins), this should report that it has established this. Then, you can return the Heating Thermostate back to where it was. You can also set up the Budget using the Web interface to set a predetermined budget. For example, you might pay £80 a month to the utility. You can set this as a budget to the charging period. So, you can keep a check on how far you have got on the budget. It also will send you a weekly report on how you are doing. After a couple of weeks. It will start comparing the tariff that you told it you were using to others on the market and report any benefit you might want to investigate. Now like all comparison websites. Because of OFGEM, they assume once you come off a Fixed rate tariff, that you stay on the standard rate. Which, I think is misleading and OFGEM should know better! However, that said. It will nag you to check every so often if you can get a better deal. We are currently with Bulb which is a variable rate that uses 100% Renewable Electricity and Gas as much as it can. They aren’t necessarily the absolute lowest. However, they do provide a good email service on the occasions that I have asked a question or two. If you use this link Here – then they will credit your new account with £50 and also pay any cancellation fees up to £150 per service. Providing you supply them the PDF bill. There is no charge to leave. So, whilst they can’t stop increases that do occur. They are well aware of people migrating away if they increase it too far. After all most of the clients were sign up due to the costing in the first place! 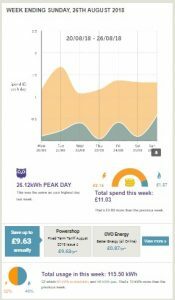 It a nice simple system to keep an eye on your energy charges for £69 and does a lot more than the current SMART Meter systems that are currently being rolled out at great cost to the UK consumers. They keep saying that the Government is doing this. But that’s our taxes being wasted as far as I’m concerned. With the little benefit to the consumer and lots for the energy companies. You could do quite a lot with 11 Billion. Even set up a fund at 6-7% return with that 11 billion would probably pay or subsidies the energy costs for OAP or not well off parts of the community for the for seeable future. How’s that for SMART thinking? Ho hum. :o( Being logical again! Well, I hope this has pushed you to at least look at the cheapest devices that actually monitors and pushes you in the right way to keep your energy costs down. Click the link below to see if you can save up to £300 a year! I’d like to encourage friends, family, & anyone else who’s interested, to find out more about Bulb & how easy it is to go green & save money. It takes a minute to get a quote & Bulb do all the work when you switch; you don’t even have to tell your current provider. Bulb will give you £50 if you use my Bulb referral code. Bulb’s customer service is excellent. Bulb’s use 100% Renewable Electricity generation. 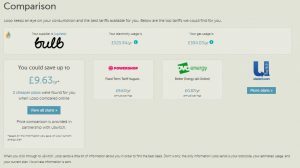 Bulb’ pays the exit fee charges made by your current supplier up £120 on request. Bulb credit your account with a £50 credit as a thank you for joining them. You can do your bit for the planet without costing you an arm and a leg. Bulb is a new UK energy provider determined to revolutionise the way the energy industry works. Bulb provide 100% renewable electricity & 10% renewable gas. Their energy isn’t just greener, it’s also cheaper. Traditionally, you have to pay a premium to go green, but with Bulb, you’ll also save money. Combine green energy, great customer service & a hassle-free switching process, & you have Bulb, in a nutshell. That’s probably why Bulb is the UK’s fastest growing renewable gas & electricity supplier. Well, you’ve just upgraded to the current Windows 10 Fall Creators update and you find a few goodies under the bonnet? It’s described here. So, I will not re-invent the wheel. But, basically. It keeps an eye on the activity of the Hard Drive and stops mass encryption occurring on both the System files and the Specific User Local folders that are currently active. The Hit on the system performance is not noticeable and certainly will not be noticed on an SSD. So, a bit of a no-brainer! So, if you are already on Windows 10 Fall Creators do it today! If you aren’t. It actually makes the pain of upgrading worthwhile. That from a Computer Engineer that normally would say hold off the update for at least 3 months. But this is a sensible improvement worth the risk. Yes, they have moved all the settings around again. But, the underlying improvement of speed of the new OS makes it worth the pain of the upgrade. So, hold your nose and upgrade to Windows 10 Fall Creators soon! This is good news as it combines the benefits of both technologies at a sensible price. This also encompasses a new building that from the start will be Netrual in it energy requirements. See the linked article for more technical information. All good new for the UK and Australia. As some of you know we have been following an AIM share called RED which has been developing a Flow Machine for 17 years. They are finally starting to see industry realising that install these Flow machines along with Solar PV allows them to bridge the gap of night time at a sensible cost. To provide power back to the UK grid when need. This is a UK installation which also has the support of one of the major six energy companies Centrica. Where Lithium wears out after 1,000+ or so charges. The Flow machines can carry on charging and discharging without any noticeable degradation for over 20 years and then by changing things like pump and few other plates. Can start the process over again for another 20 years. Once the major markets wake up to this device. Then, it will be hard to stop the orders coming in. A nice positive story on the UK for once. Well, what I had been expecting has finally happened. Amazon has been playing with Food delivery for a few years with its PrimeFresh offering. It found out that delivery of package foods was reasonably straight forward. As what is the difference of a TV against serials? Just the Past Best Date. However, fresh meat, Fish, Paste etc.. was more of a challenge. So, instead of using the capital to build the infrastructure. They have spent $13.5Bn in purchasing 430 odd stores that are located in the best part of town in the USA. The property alone would probably be worth the price. They waited until the Supermarkets were in trouble with the Food inflation and costs which were already dragging the share price of the sector down. Then, pounced at the right moment. It seems that the market has already noticed what a strategy shift has taken place by the other shares in the sector dropping from 5-15% in the day. Even stable food suppliers shares took a hit in this. P&G Unilever etc. Tesco marmite gate started highlighting the arguments between suppliers and the supermarkets. Now they have someone who is as large as Walmart overnight. Whilst ‘Whole Foods’ in the USA and UK will continue as is for a short time. You can image the stripping of overheads that is just about to happen. You have a business that has a model of the customer must be right and a 3% margin on all goods. Against, the Supermarkets that sit on a 5-6% margin. There will be only one winner as far as Amazon is concerned. Interestingly Whole Foods has a foothold in the UK. One of the richest in the EU when it comes to profits in the Supermarket sector. All of the Supermarket brands shares saw a significant drop when the news reached the LSE. I would imagine that there was a lot of phone calls going on over the weekend. There was even talk that another competitor would pay more than Amazon. But any strategic analyst is going to point out that Amazon has shown its hand. It will just pick another USA Supermarket sometime down the road. It might even wait for the ‘Whole Foods’ suitor to buy the Whole Foods chain only to then purchase the complete package in one swoop and probably getting a better deal by that time as the share prices in the sector would remain subdued. Now they have a local distribution point within the 430 odd USA towns and 3 in the UK in affluent areas. It will make the logistics of both food and goods to the door a lot easier. As with the AI that will be deployed. They will be able to judge what food they need where a lot better than the current management of ‘Whole Foods’ can and save on the waste that is currently being caused. For the AmazonPrime & Whole Foods membership, it also works well. If you have already have spent with Amazon or Whole Foods they will be able to offer better deals when food is getting near the sell by date. Saving their Prime Members money against the Membership fee (£7.99 a month). Which, already offers next day delivery, Films and Shows, Music and now Fresh food. Which you can pick up on the way home or can be delivered same day. Pharmacy in the USA is one great expense that the USA customer has. Imagine the cost savings that can and will happen. I sure that a certain US President would give them his blessing. As this would be a hit to the USA elites in their pocket. The Cashflows within Amazon could easily allow for a further increase in their Banking offering. Currently, they offer the suppliers discounted loans to allow them to buy stock to sell on the Amazon platform. One can only imagine what other offers they could also undertake. They listen to their customer’s complaints and generally place them first in the queue. Perhaps the politicians should take note? A lot of Analysts in the USA Markets were questioning the Market Value that Amazon has seen. With very large PE (Price to Earnings). Only more excitement to come in 2017….? Thats all from me…..Enjoy the Sun!! Well, it had to happen at some point. Our PV system went offline on the 7th of May and it has taken us this time to sort it out. So, looking in the event logs showed that just before it went offline the system noticed that the Varistor was faulty. This, in the end, was a Red Herring. But, at the time we didn’t know this. So, after some chasing around. We got referred to SMA Service department. They arranged for these Varistor replacements for the inverter. The Varistor protects the inverter from high voltage should a lighting strike or more likely induce high voltage spike in the PV cabling. So, these are the little things. SMA must know that these will give out as they had a section in the manual about it. So, 5 days later they arrive. So, up we go and replace them after turning off all the Isolators both on the DC and AC sides. Take the old ones out and replace them with the new ones. Making sure we get them in the right way around as it does make a difference! Put it back together thinking. Great be back online again. I’m still not seeing a Green light on the inverter. :o( Not even a flashing one. Well at least the Bluetooth works! I then checked the DC side voltage after not being able to get hold of the original installer. This read ‘0’ v DC. This is the last thing any PV installation wishes to see. As it tends to suggest that the Panel or cabling has become faulty in some way. After checking out as suggestions to me by John from 1st Solar. The first thing was to check that the PV 4mm cable had not worn by being passed over the roof tiles. Thankfully the installer had made provision by cutting out a 25x25mm slot out of one of the roof tiles to ensure that never happens. Second, was that in 2010 there were a couple of types of connector that got used. MC3 was known to have issues as it had rubber base surroundings. From 2011 type MC4 was mandatory on any MCS installations. However, the Photo Solar Technology Ltd PS240M-20/U’s came with type 4 connections. So, that wasn’t going to be the problem. But, can the eagle eyes of you notice what is wrong with the Meter reading? I’m pleased to say my installer did! He noticed that I had set the DC meter set to the 200VDC range rather than 700-1000V DC. The giveaway was the LCD showing overload on ‘L’. Ho hum….. I knew there was a reason why I went into IT rather than electronics. Once, this glaring error was corrected. 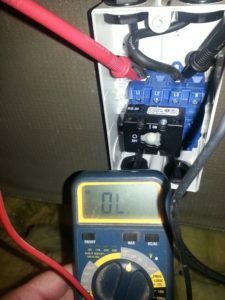 The voltage came in at 325 at 0.75amps. So, quite enough to kick off the inverter. But, of course, that wasn’t reaching the inverter as the isolator had gone faulty. :o( It seems to be a mystery why this happens. As the switch hadn’t been moved in 7 years. Must be something to do with ‘Kicks’ that happen on a snooker table! Well, basically the PV is very similar to the batteries in your domestic kit. The worst battery tends to dictate the output of the whole. So, if one of your PV panels is not feeling well as inefficiency. Then the rest follows. Also, although we don’t suffer shadowing here really. If one of the panels in sunlight but the others aren’t then this power tends to get wasted. What Optimisers do is rather than taking all of the 10 Panels as one. It individually adapts the optimiser to the panel level. Therefore, you get the best out of each of the 10 panels. So, sort of socialism into conservativism? Now what happened in the past was that they produce inverters with multiple inputs. So, you could then have one string in sun and the other not and still produce the amount of energy from the string until the other one saw daylight. As the expense of scaffolding and possible failure of one of the cables once the optimises were refitted. As they would still use the same cables. i.e disconnected and re-connected the cable. You tend to have issues later on. Although they did provide a 25-year replacement. But, I read that didn’t include the scaffolding costs. Which, would be in £400-500 against the unit replacement of £45. So, the guaranteed bit was a bit shallow in my mind. However, both quotations came in at around £3K without the scaffolding. So, even with the expected improvements of up to 25%. This was in shadowing installations. Which, isn’t the case at our location. I would need over 10 years to pay back the expenditure. As the actual equipment was around £1K at the trade price. It did seem a tad rich. We produce around 2,000 units a year @ 0.65 per unit. At 25% which wouldn’t be the case, it was £325 a year. If it had been saying £2-2.5K including VAT and scaffolding. Then, perhaps I might have gone for it. So, if I was going to do anything it would replace the complete set of 10 panels with SolarWorlds 290w at £108+VAT. Or, when the inverter dies again, to replace the inverter with a 3K and 10 x 330w panels with optimised equipment fitted. But, that will not happen until 2030. As that is when the payment for FITs is completed for our site. Once, I found out that the outside panels were good. They seemed little point in upsetting what has been a reliable installation up to now. So, I choose to purchase from CCL another SB 2.5 SMA inverter at around £851 including VAT (20%). We did better. But, still, at least it was 2K cheaper! SMA did offer me a replacement at 475 Euros +VAT & P&P. However, this would have been the same type of inverter as the original with only a 12-month warranty. Well, it didn’t weight as much as the old one coming out did! However, 7 years has made a lot of difference to both the design and features. You can also monitor it from outside using the https://www.sunnyportal.com Obviously, they have an APP for that! They have also updated the overall system so it handles shadows better and it can also handle energy management of both batteries and domestic devices. So, perhaps when the cost of lithium or RED goes down I’ll look into that option. So, all in all. I think I choose the right option this time. We now can see what going on remotely as well! Well, that’s it from me. I better go clear the place up! 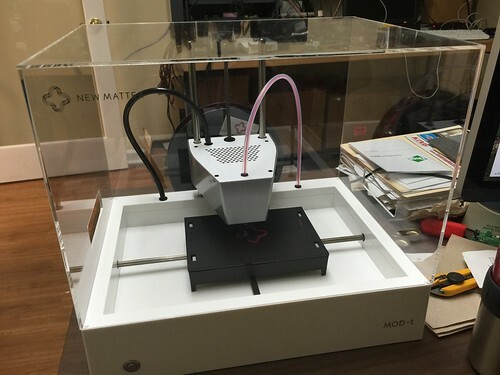 Just thought those of you that are either trying to find out what has gone wrong on your New Matter MOD-T printer or that are just interested in how it all fits together would be interested in this post that I have come across. It shows the internal component in great detail and you should be able to diagnose most issues from reviewing these photo’s which are mostly in focus.